Ya Ali Madad and Saligrah Mubarak! 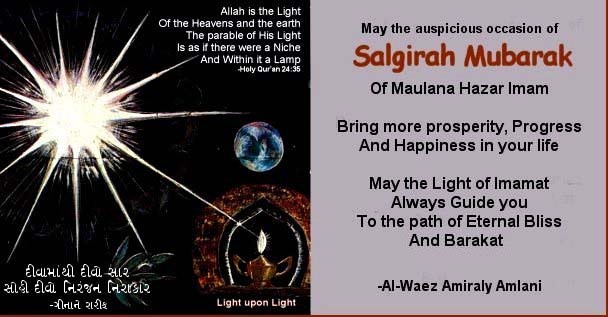 On the occasion of the 74th birthday of Noor Mowlana Shah Karim Al-Hussaini Hazar Imam (a.s.), we would like to extend Salgirah Mubarak to the global jamat. May the peace, barakat and Light of our beloved Noor Mowlana Hazar Imam continually flow into each murid's personal world! Ameen. For this occasion, I have used the card which Late Alwaez Rai Amiraly Amlani prepared for me in 2004. Please reflect the phrase 'Light upon Light' in the verse from Surah Noor (Holy Quran 24:35) and relate it to how the bearer of the Allah's Light, i.e., our Holy Imam, is changing the world through the voluminous work of the Aga Khan Development Network. Clearly the spiritual is driving the material. Let us read and internalize the poem entitled, "THE HEART THAT KNOWS" by Hasan b. Salah Birjandi, also known as Ra'is Hasan, an eminent Persian Ismaili poet and historian of the seventh (AH) /thirteenth (CE) century. Let us also learn and understand how our beloved NOOR Mowlana Hazar Imam prepares us to work in his mission. receives without a shadow of doubt the divine command. he rules the inhabitants of the spiritual world. the dust under his mount turns into a philosopher's stone. rises far above the flirtations of sensory distractions. becomes like the sun at the zenith of its splendour. he becomes their absolute master and guide. Source: Shimmering Light. An Anthology of Ismaili Poetry. 1996. Translated into English by Faquir Muhammad Hunzai. Introduced and Edited by Kutub Kassam. I.B. Tauris Publishers, London/New York in association with The Institute of Ismaili Studies, London. p.81. The concepts of Spiritual and Luminous Nazranas are grounded in the belief that the willing submission of a reasoning person to a Higher Being through a personal search, leads to the development of a pure golden heart which then enters into the realm of enlightenment. The mu'mins who achieve these higher spiritual states can perform long lasting service to the mission of the Holy Imam. Therefore, each one of us has to strive to go higher and higher in dhikr and bandagi so that we can serve the Holy Imam and his institutions with courage, strength, loyalty, enthusiasm, humility and pure moral values. May the Saligrah of the Holy Imam bring peace, light, barakat and tayid (spiritual help) to you, your family, your Jamat, the global Jamat and humanity at large. Ameen.